Well isn't that fancy looking? I decided to just dive right in and am now typing after I've finished my first serving and by serving I mean a 1/4 pint at most. This is some dense, flavorful frozen treat so a little goes a long way. Basically it's really cold peanut butter fudge. I know that is its name, but I mean fudge as in fudge, not fudge as in fudge sauce. Besides the fact that it would melt if I cut it into cubes to serve, I'm pretty sure I could tell people this was some funky new fudge and they would believe me. Hopefully the swirls aren't only on the edges. To be honest, this one feels like a shot right at Ben & Jerry's non-dairy lineup. While it doesn't claim to be non-dairy, it sure seems to be dairy free (they don't do their little circle stamps on the side anymore to tell you what's up with the pint). I bring this up because I would much rather have this than the almond milk alternative. Yes, it is kind of dry and takes a little getting use to, but I wasn't scared off. I didn't have to prod myself to continue. Ok, maybe a little at first. No, not really. It's definitely different, but still kind of fascinating. You think "where does all this creaminess come from?". It's not milk level creamy, and like I said, it is dry to some degree, but it wasn't hard to press on. It was just so dense and rich that I wasn't really sure when I should stop. To recap the rambling, we've got a nice fudge like product with plenty of flavor that's not too sweet and not too salty. It's good though and more importantly it's not a flat flavor. I hate flat peanut butter. It's so boring. This does have a certain level of richness to the texture and flavor. 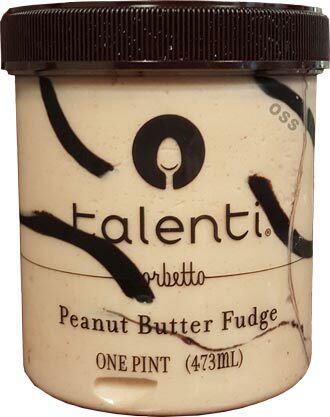 It's not straight peanut butter, this isn't JIF on your spoon, but it's just an interesting change up from Talenti. I thought this would be good if not a little restrained, but the fact they made it a sorbetto is a very interesting choice. On Second Scoop: (Oops, I had my second scooping without filling this part in) This is a nice product and I'd love to know what our non-dairy friends have to say about it. The only issue I will really point out is that this came out as the same time as the Haagen-Dazs version which is an absolute delight to eat. H-D is creamier, has more of a chocolate factor, and brings the crunch factor. 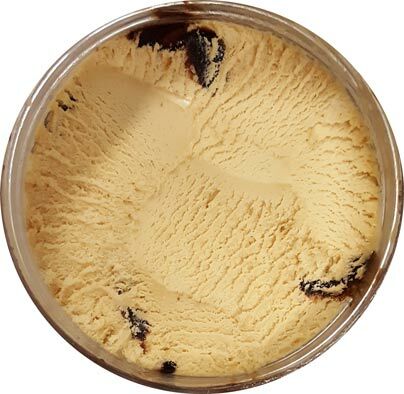 Talenti's take is a much more straight forward product. I see this as more of something you nibble on as opposed to something you inhale. Give it a try and let us all know what you think. Verdict? is decadant the right word here? 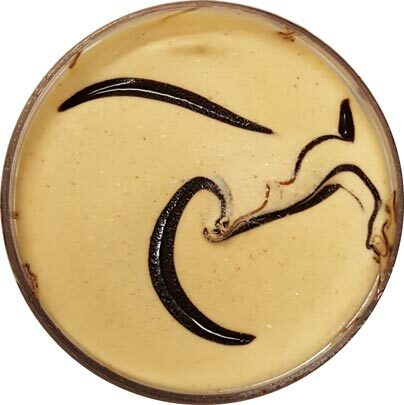 Yay, I'm excited for new Talenti! How does this one taste next to their PB Pretzel? I know one is a gelato and one is a sorbetto, so it might not make sense to compare the two, but that one's one of my favorites. This looks amazing - sign me up! Can't wait to hunt for these new flavors! Thanks! Have to check this one out, and the blueberry crumble too. I haven't found anything yet - it's making me crazy! Peanut butter isn't my favorite flavor, but the other two sound interesting. I found all four new flavors at my local Safeway (in Washington, DC). I fell in love with the Peanut Butter Fudge -- so creamy, so dense, so peanut butter fudgy! I still can't believe it's a sorbet, not gelato. But I have no interest in trying the other three flavors (Vanilla Blueberry Crumble, Peach Butter Biscuit and Vanilla Chai, probably because I don't really like fruit flavors or vanilla). So I'm bummed that only one of the four new offerings interested me, but delighted it was so amazing! I found this flavor at my local Hannaford. So good! My boyfriend who hates peanut butter ice cream, stole this pint away! I just wish Walmart carried this flavor already since they're about a buck cheaper per pint for Talenti. Not sure if it replaces the coconut gelato as my favorite Talenti product though. I looked on Talenti's website but have yet to see any new flavors. Are they not yet available to the public? Right. I just was curious about the ingredient list and nutrition facts of these new flavors due to various food allergies in my family...haven't seen them in any stores yet. @Lb: ahhhhhhhhhhhh, gotchya! I try to post this info but the swirls of fudge make the nutrition and ingredient panels very hard to photograph. give me a few minutes to improvise something. Thanks! Hope I can try this flavor soon, the fudge looks delicious...glad it is wheat free. Best dairy free frozen dessert! So glad I stumbled upon this tonight at Publix! The real fudge pulls it all together nicely.